The book begins with evaluation challenges as well as the evaluation approaches to tackle them. An overview of how evaluation can contribute to understanding sustainable development is followed with the potential of gender and equity focused evaluation to “leave no one behind”, and participatory evaluation to give the people a voice in their future. 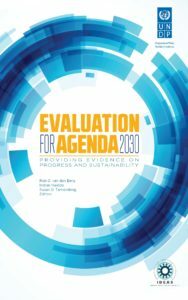 The second part discusses capacities and capabilities needed for evaluation focusing on sustainable development. The third part focuses on regional perspectives as evaluation becomes increasingly country-led, focusing on their development priorities. The fourth part examines the negative impacts of development displacement, looks at evaluative evidence on the contribution safeguards make towards sustainability, and highlights resettlement policies and practices in development. The book’s fifth and final part looks at various efforts to provide evidence that an intervention, policy or action lead to impact, not only at the level of the intervention but at national, regional and global levels. This section also explores new frontiers for evaluation as SDGs and the 2030 Agenda require new partnerships, new modes of operation, innovative ways of financing that pose special problems for evaluation.